Things didn't always look pretty for the Huskers Saturday night against Purdue, but Nebraska came through when it needed to and pulled off a 25-24 come-from-behind victory over the Boilermakers. Hail Varsity's Greg Smith, Jacob Padilla and Derek Peterson offer three final takeaways from the win. What a wild ride this game was. In a lot of ways this game was just like so many games this season –a complete lack of any run game, busted plays on defense and too many injuries to name. However, tonight we saw the difference it makes when you have a quarterback playing at a high level. Tanner Lee saved Nebraska’s season for a week with a gutty performance completing 32 of his 50 passes for 431 yards and two scores. I guess Purdue head coach Jeff Brohm wasn’t kidding when he said Lee is the best quarterback his team will face outside of reigning Heisman winner Lamar Jackson. This one clearly wasn’t pretty but Nebraska doesn’t have the luxury of worrying about style points. Each victory gets them closer to a bowl game and each victory gets their coach a bit further away from the hot seat. It stood out to me that Chris Weber acknowledged just how much the team wants to win for Mike Riley. Riley’s job status is obviously the elephant in the room and it sounds like the team is using it as a rallying cry to produce more wins. Now we see if they can build on the win as they head into the next week. Nebraska fans saw some new faces take the field on defense in West Lafayette on Saturday. 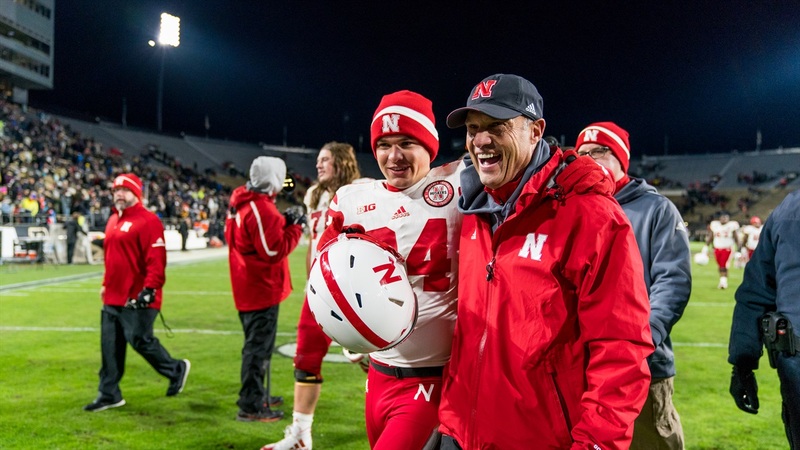 As new injuries continued to deplete the team’s depth and, perhaps in some cases, as the defensive coaches wanted to get a few guys a shot, three Huskers played their first defensive snaps of the season (and their careers) in Nebraska’s 25-24 win. Nebraska was already without junior Luke Gifford and sophomore Tyrin Ferguson at the Dog linebacker position heading into the game, and when starter Marcus Newby got banged up late in the first half, the Huskers turned to sophomore walk-on Jacob Weinmaster out of Loveland, Colorado. The 6-foot, 215-pound linebacker recorded solo tackles on back-to-back plays, tackling a receiver after a gain of 7 yards then stuffing a run for 2 yards on the following play. DaiShon Neal, a sophomore defensive end out of Omaha Central, checked in during the third quarter and assisted on a tackle, his first of the season and second of his career as a Husker. He had played strictly on special teams up to that point. Collin Miller, a redshirt freshman who earned scout team defensive MVP honors last season and had bounced back and forth between the inside and outside linebacker positions, saw his first defensive action as well after playing on special teams all season. Snaps for Weinmaster, Neal and Miller raises the total of players who have seen action on defense to 29. Five of those plays are seniors, eight are juniors, 10 are sophomores and six are freshmen. Defensive coordinator Bob Diaco has mentioned the youth of this defense multiple times, and the participation reports and roster splits bare that out. Whatever the circumstances, a couple of young Huskers got their chance to see the field on Saturday and made the most of it. Purdue had two pass completions go for 20 yards or more against the Huskers, but it could have had a number of even bigger plays had a few things broken its way. In the second quarter, Purdue wideout Isaac Zico broke away from senior corner Chris Jones only to drop a perfectly thrown over-the-shoulder ball from quarterback David Blough that would have resulted in a 55-yard touchdown strike. Purdue scored four plays later so the drop didn’t matter as much, but how Zico got open did. Jones, still trying to work his way back into the honorable mention All-Big Ten player he was a year ago, was beat often on the day. Jones struggled with that Saturday night, but to his credit, he owned up to it after the game. Heading into the weekend, the Husker coaching staff was excited about the idea of having their full secondary back healthy and finally seeing the picture they expected to see before the season started. Jones is a big part of that picture, but he has struggled in the two games and change he’s seen since returning against Wisconsin. Despite the inconsistency, he said his team has been picking him up.